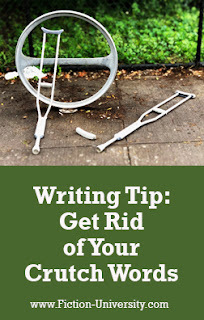 This week, cut or revise your crutch words—those pesky and weak words you tend to overuse. Crutch words are words or phrases we tend to overuse—our go-to words we can slap down and not think too hard about. You might notice you use a certain dialogue tag, or mannerism a lot, or you always describe something a certain way. Every writer has their own set of words they use over and over, and it can vary from book to book. For example, mine are just, only, and so, and I’ve had eyes widen and fell into step beside me appear way too much in various books. Too many repetitious words, phrases, or images can make a novel feel stale or even poorly written if readers notice the same things popping up. One of the features of Liquid Story Binder I used a lot was one that listed words in a manuscript by frequency of use. It made it easy to see which words I was over-using. I wish Scrivener had such a feature. I use https://tagcrowd.com/ to help me spot over used words. I have no idea what the word limit on this is, I've put 25,000 words in before though.